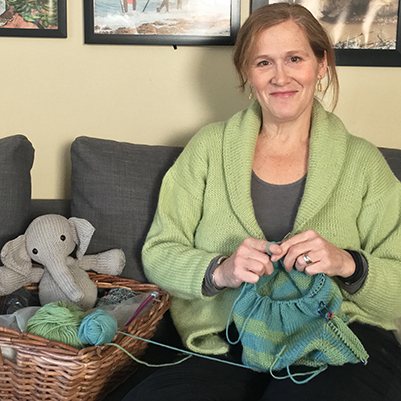 Knitting extraordinaire Helen Lister has taught hundreds of people to knit and she can teach you too! Under her expert tutelage, you’ll learn to knit by making a sweater. Diving right in with a sweater (as opposed to a scarf) allows you to learn all the basics and gain confidence for your next project. Plus you’ll end up with a great-looking wearable item! In this class you’ll learn how to cast on/cast off, knit, purl, increase, decrease, knit a gauge, and read a pattern. You’ll also learn how to choose corresponding yarns and notions right for the job. If you’ve always wanted to learn how to knit or have tried knitting but only felt comfortable knitting a basic scarf, this is the class for you. If you can’t make the evening class, there is a corresponding afternoon class being held from 2:00 to 4:00 pm on Thursdays.